Botanical Name: 1. Typha orientalis Presl; 2. Typha angustifolia L.
Part Used & Method for Pharmaceutical Preparations: The pollen is gathered in May or June. Functions: 1. To stop bleeding; 2. To release stagnation and stop pain. 1. Hemorrhages manifested as cough with blood, vomiting with blood, hematuria, bloody stool and uterine bleeding. Cattail pollen (Puhuang) is used with Agrimony (Xianhecao), Eclipta (Mohanlian) and Biota tops (Cebaiye). 2. Hemorrhages caused by external injuries. Cattail pollen (Puhuang) can be used alone and dry for external use. 3. Blood stagnation manifested as cardiac pain, abdominal pain, dysmenorrhea or postpartum abdominal pain. 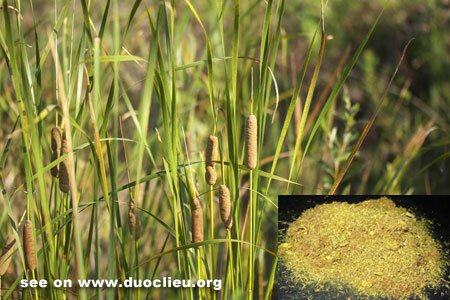 Cattail pollen (Puhuang) is used with Trogopterus dung (Wulingzhi) in the formula Shixiao San. Cautions & Contraindications: The carbonized herb is effective in stopping bleeding; the raw herb is used for releasing stagnation and stopping pain.